DALLAS--(BUSINESS WIRE)--The Business Travel Performance Index (BTPIndex), a sophisticated, unique solution allowing travel managers and their travel management companies (TMCs) to transform hotel program management through increased attachment, officially went live today. Sabre Hospitality Solutions and Fare Audit are strategic launch partners in the BTPIndex. Existing Sabre customers who currently use the Sabre Hotel RFP product have first and immediate access to the BTPIndex, with additional customer channels to follow in the coming months. The evolution of booking options for corporate travelers has created a fundamental challenge for travel buyers: off-channel hotel bookings and a resulting reduction in hotel attachment rates. Though travelers may be using the appropriate channels to book their flights, many are “going it alone” when they select their accommodations, reducing travel managers’ and TMCs’ visibility into their overall program spend. 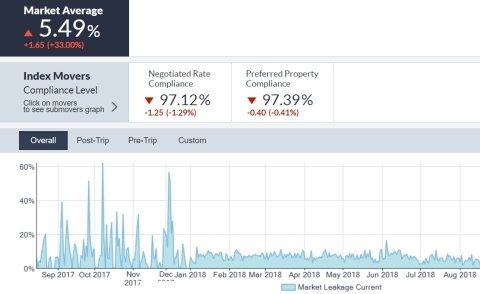 This makes it difficult for TMCs and their clients to monitor traveler compliance, take corrective actions, assess changes in the program and market conditions, and adjust the hotel program accordingly. The BTPIndex aggregates and normalizes booking and spend data from all available sources, such as GDS data, credit card information, expense reports, negotiated rates and other performance indicators (customized to each company), to deliver an unprecedented level of insight into hotel attachment rates, and to allow TMCs and their clients to implement strategic hotel management. As a result, travel managers may see up to a 20 to 30 percent increase in hotel attachment, a 20 percent increase in savings, and a reduction in hotel negotiation time investment to just one to two hours per month. The Business Travel Performance Index is a unique hotel program management platform aiming to set the standard for how effective hotel programs are managed. BTPIndex aggregates and normalizes a wide range of hotel program data sources into one, easy to digest number that allows travel managers and their travel management company partners to drive a better return on investment from their hotel spending. BTPIndex operates in a strategic partnership with Sabre Hospitality Solutions and Fare Audit. More information can be found at www.btpindex.com. BTPIndex announced today its availability to all Sabre Hotel RFP customers.